One of my favorite eyeshadow palettes are definitely the 'Sleek' Palettes. They are so inexpensive and super pigmented. In each palette you get 12 colors and a huge mirror for a price of only €8. Sleek is an English brand, but you can find it online at many beauty shops or Ebay. This look I created with the 'Au Naturel 601' palette. I used the 1st, 4th, 7th, 10th, 11th and 12th colors. On the lips I am wearing MAC's 'Vegas Volt'. It turned out to be a smokey day time look. You can see the look in a video from a new project I'm going to be part of: KARMAFLOW. More about the products after the picture. My question to you; have you found a great waterproof make up remover that is affordable and gets rid of the strongest of waterproof mascaras? Please let me know in the comments! This oil can be used for body, face and hair. I have only used this for my body. It's bigger brother is standing in my closet and is actually a spray. The travel size is just a glass bottle without the spray top. Like this it is more difficult to spread the oil and you will most likely waste some of it too, if you are a bit clumsy like me. For traveling it is not the best because of the glass bottle. Therefor I will not refill it and will use a plastic container instead. One of the best smelling body creams out there. I wouldn't call it a body butter because it is light like a body lotion and nothing like the Bodyshop body butters. I used it mainly for my arms and hands before bed time. I find the scent really calming and perfect before falling asleep. During my review on Korres Guava products, I wrote that it wasn't available in Germany anymore. Well, I found them again in Mueller and already got myself a back up. Still the perfect body lotion for me. I keep on repurchasing this until they stop making it. It contains 40% oil, so it is really oily. It doesn't make the skin sticky like so many body lotions. A great pro is that it leaves your legs nice and shiny. Perfect for summer legs. This smells like lemon cheese cake. It does the job, it's vegan and good for the skin. It cleanses gently, but doesn't really hydrate the skin so well. You would still need to apply a body lotion afterwards. Since I got so hooked on the scent of guava, I decided to also get the shower gel. I've used it up, it does the job, but is nothing really special. I won't be buying this again because it is way too pricy compared to other cheaper shower gels that do a much better job. This I use every morning to gently cleanse my face. It is extremely mild and perfect for my sensitive face. Too many times have I gotten rashes from face wash products. This one is safe to use and has been my nr. 1 since many years. This has to be the most hyped make up remover in the beauty scene. Many professional make up artists swear by this products, so all the other beauty fanatics run to the shop to get it as well. So did I. This has to be my 8th bottle so far. I use this to take off the make up on my face before I use a face wash. It doesn't take off waterproof mascara unfortunately. I haven't gotten any rashes from this product so I am sticking to it. At the moment I am testing a cheaper alternative from the drug store. Will report back once I've used to for a while. Smells lovely and does the job. I am trying out different deodorants without aluminum. My base coat for as long as I can remember. Totally affordable and can also be used for a neutral nail if you apply two coats. It dries fast and makes the nail polish last without staining your nails. It dries out my nails and has an excruciating scent. Will not buy this again. Ebelin makes better nail polishes without acetone that don't dry out my nail or nose and brain for that matter. A great concealer that has lasted me years. Now it is time to throw it out because the formula has dried out and it is getting old. This was standing at my night desk for quite some time. I never used it during the day because it a white lip butter and also not suitable as a base for lipsticks. The scent is lovely, but I prefer to use other lip care products that are easier to use. A great product to take off waterproof mascara. It lasts a long time and does the job pretty well. I still haven't found a make up remover that really takes off that nasty waterproof mascara that lasts for 75 hours. Another deodorant that contains aluminum chlorohydrate. It does the job, but is not the healthiest option for your body. I prefer rollers because they don't suffocate me. Rollers have the disadvantage that it takes forever to dry. A great drugstore conditioner for slightly dry hair that doesn't wear the hair down. It is affordable and you get a lot of product. The scent got to me, but the oil in the shampoo makes my hair get greasy really fast. There are better shampoos out there that are less pricey. I have used this all the time before I would curl my hair. Smells divine and has a great 'spray'. It distributes the product nice and evenly and doesn't leave wet patches in the hair. A great shampoo to travel with. My scalp had to get used to it, but my hair loved it. Super shiny and silky soft. The scent is also amazing! I might get the full size one day. A souvenir from my last tour in the US. Absolutely amazing hair mask. It doesn't contain parabens, petroleum, mineral oils or artificial colors. The scent is really strong, you have to like it because it wears like a perfume. The boys in my band loved it and I even had to buy it for one of our crew guys. This seams to be a scent that guys like as well. I haven't worn any purple eyeshadow for the longest of time. Lately I have been grabbing the usual neutral tones that don't need much thinking and you can just slap on. When I was reorganizing my make up collection, I found these gorgeous pigments from NYX. Great thing is that they are super inexpensive and come in a great variety of colors. The only downside is the packaging. Pigments are already tricky to work with and these just have a very unpractical packaging. If you don't mind getting your dresser dirty, you will be fine. I advise you to keep a tissue underneath to keep the messiness at a minimum. Do any of you own any NYX pigments? Tim Burton has been my favorite director of all time. 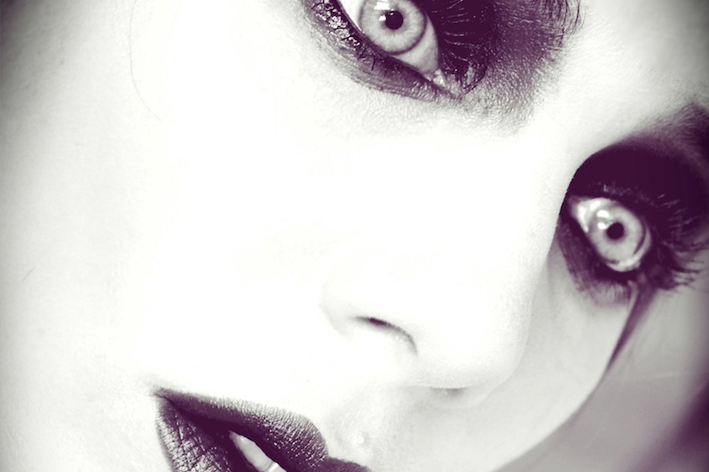 When I introduced the 'Movie Make Up' series, I knew I had to include a Tim Burton Look. There were so many to chose from, a lot of colorful ones. Since you mostly see me in colorful make ups, I decided to go dark and picked Victoria Winters during her final scene of TB's remake of 'Dark Shadows'. It is super easy and a lot of fun to do! 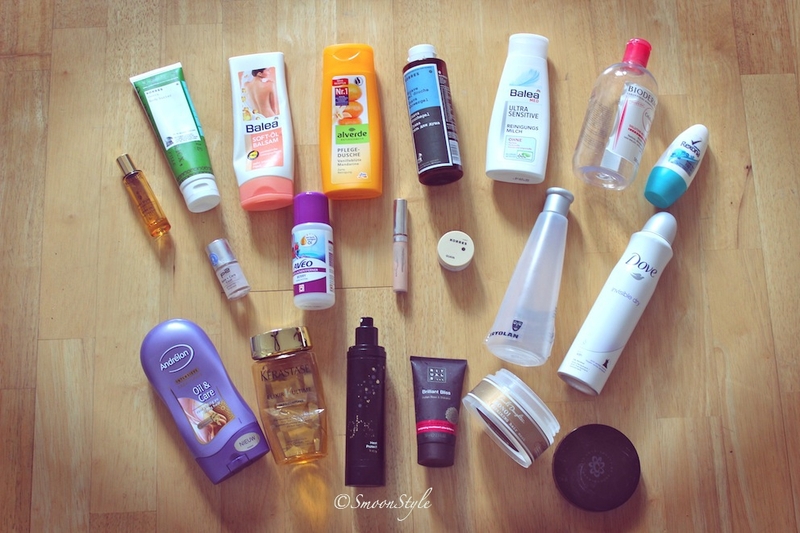 Once again you don't need many products. 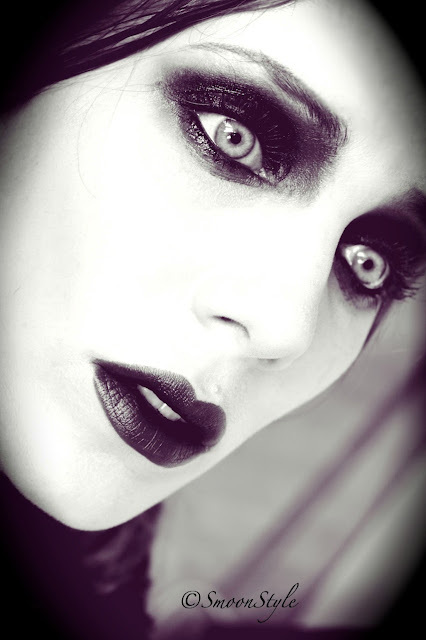 This look consists out of a super pale foundation (I picked KRYOLAN's Body Foundation in Ivory for the neck and face), black eyeshadow, black eyeliner and Elizabeth Arden 8 hour cream on the eyes. Throw some water in your hair and pick a dark lipstick of your choice. Et voila! Hope you enjoy the Dark Smoon. The approaching summer is always a good excuse to get a new fresh haircut, split ends even more. To get rid of my split ends I decided to get some layers in my hair and still keep the length in the back. Beginning of May I made an appointment with a new hair dresser and am really happy with the end result. Split ends begone! My hair is easier to style and doesn't way down as much as before. It has more volume due to the cut. It is always a little scary when you see all that hair lying on the floor, but my hair feels so much better now. To create the 'Wavy Curls', I use the Remington 32mm wand. It's my current favorite curling device. I take bigger sections of hair and only curl the ends for 10 seconds on 180 degrees Celsius. After the hair is cooled down, I shake them a little. I don't even always use hair spray since it takes away the freshly washed feeling and the curls stay in without it as well. It takes up about 10 minutes to get my hair looking like it does on the picture. Any of you thinking of a new summer hairstyle? Let me know in the comments! The lipstick that I'm wearing is Clinique's 'Heftiest Hibiscus' intense Chubbystick.